About 100 students made first-time decisions to follow Jesus on Wednesday night at Momentum Youth Conference, the annual event sponsored by CE National. They responded to an invitation issued by the evening speaker, Afshin Ziafat, a pastor from Houston who was raised in a Muslim home. Abraham was called to sacrifice his son. In Ziafat’s case, he had to let go of his own father, who disowned him when Afshin came to faith in Christ. “What is God calling you to lay down?” he asked. 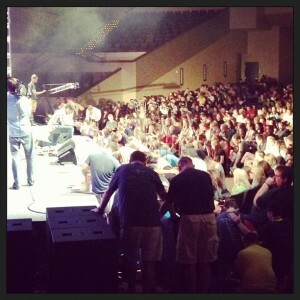 He encouraged the students to worship God in the journey. For Abraham, it was at least three days – a long grueling marathon. For Ziafat, it has been loving his father and being consistent in his faith since he accepted Christ as a teen. The result has been seeing several family members also accept Jesus as Lord and Savior. The evening ended with worship led by Jeremy Byng and the Link Collective from Grace Community Church, Goshen, Ind. (Jim Brown, pastor). See photos from the day at the Momentum Facebook page.